If your smile is missing one or more of its teeth, we’ve got a secret for you. Nothing can complete it better than dental implants. They’re so good at replacing natural teeth that some people actually call them nature’s rival — keep reading to learn more about this fantastic option in tooth replacement today. As your trusted dentists at Brooks Dental, we know that if you’re dealing with the stress and anxiety related to missing teeth, you won’t regret choosing dental implants in Winthrop. 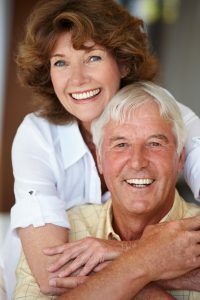 Dental implants have come a long way over the past several decades. What was once a highly invasive, costly procedure with a low rate of success is now the absolute best choice almost anyone dealing with one or more missing teeth can make. It’s affordable, successful and a wonderful investment for your overall health. Unlike other options in tooth replacement, like fixed bridges or non-implant supported dentures, dental implants replace both the missing tooth and its root. That’s important because it keeps your jawbone healthy and prevents degeneration — meaning you’re less likely to lose even more teeth later on. That’s a major benefit of choosing dental implants over other options. Some more advantages of this tooth replacement option include the following. Dental implants restore your ability to eat, speak and chew like you’re used to. Osseointegration means that dental implants fuse with your jawbone, creating the sturdiest foundation for your new tooth replacement. Dental implants are easy to clean and maintain. When cared for properly, dental implants can easily last for the wearer’s lifetime. If you’re interested in having your teeth replaced with dental implants, the only way to know for sure if you’re a good candidate for the treatment is to schedule a consultation at Brooks Dental. During your initial appointment for dental implants, we’ll check for two things. First, we’ll make sure you’ve got enough jawbone to support your dental implants. Sometimes teeth have gone missing for so long that significant degeneration has already occurred. When this happens, bone grafting or other options may be discussed. Second, we’ll examine your mouth and discuss your overall health with you. Patients suffering from gum disease or conditions that weaken the immune system, like HIV or diabetes, are not good candidates for dental implants. Do dental implants sound like the tooth replacement you’ve been looking for? If so, don’t wait to contact Brooks Dental to let us know. We can help you complete your smile in 2016 — click here to schedule your appointment right now.